Among all the studios that produced shows this year, I liked the production that came from A-1 Pictures. Granted, Fractale was a disaster to start the year, but there was still consistent creativity coming from the studio. Blue Exorcist, Working'!! and their idol-group productions The iDOLM@STER and Uta no Prince-Sama gathered some solid fan bases, but I still insist that their best work came from Ano Hi Mita Hana no Namae o Bokutachi wa Mada Shiranai. 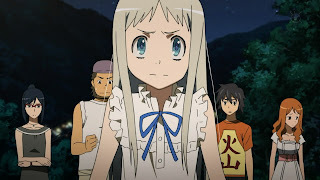 AnoHana does live in infamy as being the only noitaminA show that wasn't picked up for online streaming by Crunchyroll or Funimation this year. This was perhaps one of the biggest debacles of 2011, as I felt the show had the emotional difficulties of growing up that followed other noitaminA dramas such as Wandering Son. There was also a rather palpable realism to the show, despite the fact the show was about a ghost. The settings were borrowed from real locales in Saitama Prefecture, while the characters actually changed their outfits from episode to episode, something that I really appreciate in anime shows. No one wears the same clothes every day! Disclaimer: I have not finished all of Bunny Drop. However, I do commend it here for being one of the more discussed shows from the summer and one of the more popular noitaminA shows. Granted, some of that talk revolved around the final chapters in the manga (NO SPOILERS! ), but a lot covered the idea that the show resembled a plausible scenario that could realistically happen amongst the current familial structure in Japan. 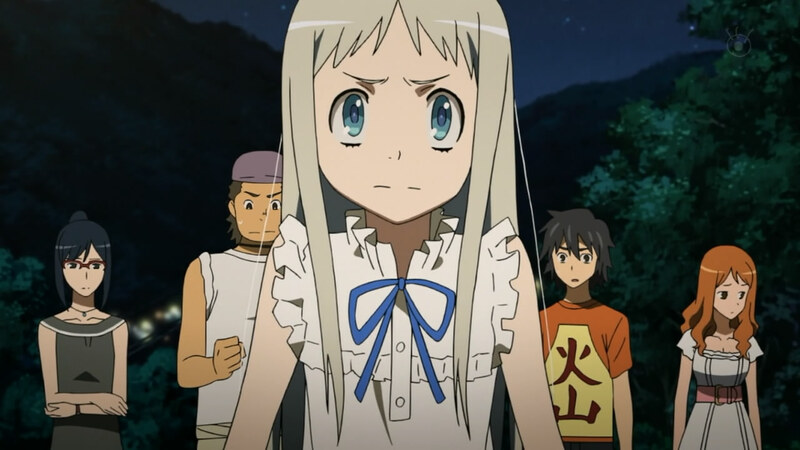 A single hard-working male such as Daikichi in no sort of relationship raising a young child like the adorable outspoken Rin is not exactly common, especially in a society that has traditionally burdened the mother with the responsibilities of homemaking and child rearing, but because of its rarity, it forced many viewers to reassess how a family works in Japan. It was good to see Bunny Drop resemble the manga's light-lined style, and I'm thankful the producers and the original creator Yumi Unita did their best to make this show feel like one that had social and ethical weight. Too many shows focus on the offspring as a member of society while dismissing the hassles that may come from the single-parent (or in some cases NO-parent) family. Not enough of them focus on the love between parent and child, especially in the case of an adoption. C is for...[C]: The Money and Soul of Possibility. The name itself ultimately turned into just [C] over time, but this show was one of the few from Funimation that grabbed attention. Considering all of the global frustration with jittery stock markets and fragile economies, [C] came just at the right time to put a spin on "ownership" and the influence that competitive capitalism has on humanity. [C] was one of those awkward shows that didn't exactly dazzle with artistry, as the cel animation and CG occasionally exhibited friction, but the idea of money being used as more than a fuel for barter systems intrigued me. While some compared the challenges between "Entrepreneurs" and their pet-like "Assets" to a fusion of Monopoly and Pokemon, I liked the general "Rumpelstiltskin" effect that the show demonstrated—present-day risks and bad decisions do have influence on the future. Pay Peter by robbing Paul of his future happiness. Yeah, this blip on the radar from writer Eiji Nonaka (Cromartie High School) and artist Maru Asakura (090 Eko to Issho) likely won't appear on any DVD in the US, due to the fact all eleven episodes could barely fill a forty-five-minute reel. However, as far as short vignettes go, this show outperformed other short-attention-span flash-animation efforts from this year (Nyanpire, Morita-san wa Mukuchi, Tono to Issho). In a way, the shorts about a school's "traditional arts preservation club" resemble Nonaka's previous efforts in Cromartie High School, the comic stylings constructed to create a quick end to the humor by episode's end. Much like Cromartie, the assembly of the animation leaves movement mostly for the hands and mouths, each character looking off at the same 45-degree angle, but that leaves more attention to be left for the content of the humor. While the Double-J shorts were meant to be appreciated with the rest of the Yuruani? experimental anime block, there wasn't a lot to appreciate from the rest of the vignettes. Realistically speaking, many might also see the show as being worth as much attention as the crafts being done (i.e. toothpick carving, omikuji crafting), but in the same way that main character Hajime sees the world in the end of the show (from space! ), perhaps we should appreciate the minor traditions out there, as they help the world go around. This is a horrible transition, I know, and its entry into this article shouldn't be misconstrued as some sort of good that came from the past year, but the March 11th earthquake and the resulting tsunami off of the Pacific coast should never be forgotten. 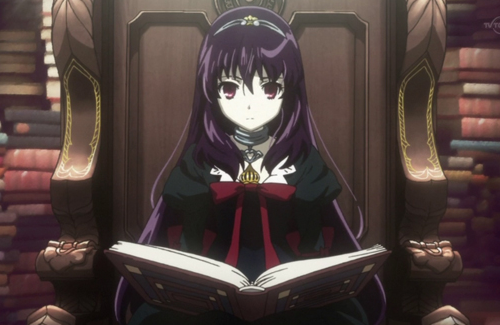 If anything, it might have thrown a harsher sense of introspection into the anime industry. The massive tragedy produced aftershocks in the shows that ran in Spring of 2011, as some shows were delayed due to production disruptions, while others suffered from the subject matter itself. Onii-chan no Koto Nanka Zenzen Suki Janain Dakara Ne!! had one episode (thankfully) pulled from re-runs due to its inclusion of a giant metaphorical wave that washes the characters away, while shows and movies that involved actual disaster scenes such as Puella Magi Madoka Magica, Precure All-Stars and Tokyo Magnitude 8.0 had to be rewritten or displaced for a better time. Even scenes for the second season of Kaiji had to be reanimated and revoiced to soothe any possible allusions to the disaster. Let's also not forget that the much-anticipated Anime Contents Expo and the Tokyo International Anime Fair events were canceled in the shadow of the emergencies happening in Fukushima and Tohoku. The March 11th earthquake should never be forgotten and will likely serve as a reminder that there are bigger things in life than anime. It's quite possible that such effects from the natural disaster will bring more sensible titles in manga, especially those that question the safety of the Japanese people and corruption in government regulatory systems. Will we perhaps see another Giant Robo, where energy crises led discussions between characters, or a Ghibli film that covers the instability of nuclear power? The Fate/stay night show is definitely one I would like to revisit after watching Fate/zero's story unfold, and perhaps that's giving me a different perception of the overall vibe the light novel series provides. I had first dismissed Fate/stay night as just another drama, but now that I'm able to get the background that surrounds the "Holy Grail War" together, I want to explore what follows Fate/zero, especially in the analysis of the characters. The intersection of nobility and military from different times and locations brings together an intriguing cast of historical characters, and the seven roles for the "Servants" allows for flexibility, as each "war" requires a reset of the Servants. Ergo, the only returning Servants—Saber and Gilgamesh—are well-known, but their backgrounds require some revealing, and stories can be fixed to the five new Servants. The art and soundtrack are incredibly solid aspects of the show, but a Nihongo-lover like myself was actually ultimately drawn by the incredible acting. Perhaps this is a result of many of the teenagers from Fate/stay night being replaced by their older parents and relatives, leading to deep-voiced assaults on the philosophies and stratagems of war. I still cannot believe that I missed the window on this manga and anime. If I had stayed an extra year in Japan, perhaps I would have been chained to Shônen Jump long enough to have been exposed to this hidden gem. That doesn't mean I'm not going to jump on this runaway rickshaw and enjoy the ride before the spectacular crash. Yes, there are jokes about d*cks, sh*t, t*ts, vom*t, kn*ckers, and everything else that you would expect to come out of the Kabuk* D*str*ct. Yes, the show tends to have its dramatic episodes that drive it out of "parody" designations, only for a non-sequitur to force it back into its place. However, I'd argue that the show knows its limits and bounds, while the producers know exactly where the lines are drawn to give it both a comedic and dramatic edge. The show has edges like South Park, in the sense that it explores both current events and celebrity with reckless abandon, but the targets are mostly social tropes (i.e. sim girlfriends, Japanese rap fans, host club attendants, other Shônen Jump shows). I've watched many comedies over the years, and I find it exhilarating that one has embraced manzai comedy to the level that Gintama' has. Some might dismiss the yelling of obvious observations coming from some of the straight-man characters as annoying, but to me over-the-top reactions are the sign of a good manzai act. To put it simply, I don't think I've come across an enjoyable comedy like this since the likes of Excel Saga, and it's going to take another comedy that tests the borderline between taste and vulgarity before it can top Gintama'. When such a comedy does make its presence felt, the theme song will likely be sung by...the entry for H in the next installment of the 2011 Anime Encyclopedia.